This is a touched up photo of the one taken on glass and backed up by a piece of black velvet. It was ruined by being stowed in a moist storage area in Missouri. 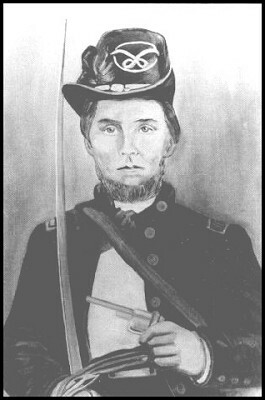 Lt. Robert H. Moore enlisted in Mercer County, MO in 1863 and became a cannon Commander. He had three childeren but felt compelled to join the Union Army. He stayed until the Civil War was over and arrived home in 1865. He is my great great grandfather. I do not know the Regiment or Company. The Civil War records list several Robert Moores and our does not show up. This is a photo of my wife's great grandfather. She has the original on glass and backed up with black velvet. It is in a brass and wood frame that folds closed. 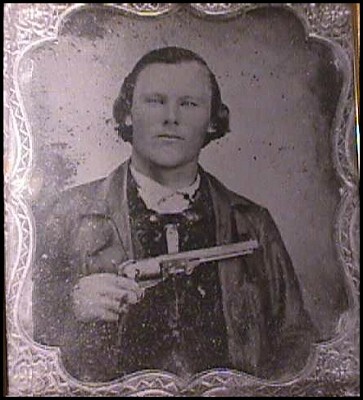 It was taken in June of 1862--he died in late August of 1862, somewhere in Arkansas. She filed for a pension in 1879 and received it two years later after a lot of hassle. He enlisted in the Texas Cav. in Pinto County. His home was near Meridian, Texas. His name was spelled as Ernst, Earnest, and Ernest. We are pretty sure his father was of German ancestory. His mother was Mary Wallace -- Her parents were from Wales.